A comment was recently left on a previous blog post about a plan to build a large new maintenance facility for Crossrail trains in Plumstead. The plan is for a temporary facility to be used whilst construction is ongoing, and for it to then become a large permanent base for 11 trains. This was news to me, and I have been following the scheme quite closely. ” Crossrail are applying to have the train stabling and maintenance site just off Church Manor Way. This takes away land from the Church Manor way allotments and sports ground. The potential environmental impact of this on the local area is alarming. Trains coming back and forth from 4.30 am until midnight, potentially major noise, light, pollution run off from the site. They are currently consulting on this and hoping they don’t have to go to a have a Parliamentary Inquiry. Greenwich Council closed the consultation on the planning application for the access road to build this BEFORE they held a meeting with the allotment holders. You can see the application here. Crossrail has applied to the Royal Borough of Greenwich for planning permission to build temporary railway sidings at the White Hart Triangle, Plumstead and propose to use these between 2013 and 2017 in order to install various railway systems (e.g. track, signals, power cables) along the length of the Crossrail tunnels. When the temporary work is finished, Crossrail then proposes to convert the site into a permanent base from which the Crossrail network can be maintained and where trains can be stationed when not in use. The plan shows the area needed and how it could be used. The construction of these works will take place between mid 2017 to early 2019 when the permanent sidings and maintenance facility will become fully operational. This proposed facility will act as the main base for the trains which will be required to maintain Crossrail’s new tunnels beneath Central London and will include 3 railway sidings for maintenance trains. It is also proposed to stable 8 passenger trains on the site. The site will also include staff accommodation, a maintenance building, storage areas, a train refuelling point, a train wash and staff car park. The plans are up before the councils planning committee next Tuesday 25th June at 6:30pm in Rooms 4 & 5 at the Town Hall in Wellington Street, Woolwich. The full agenda can be seen by clicking here. This is a major scheme adjoining allotments and a sports ground. It is mostly away from residential areas, though Marmadon Road in Plumstead may experience increased noise and lighting. A positive is the employment opportunities the new sidings present. In other news the demolition and rebuilding of Abbey Wood station to accommodate Crossrail will commence in September, far sooner than I expected. I still havn’t seen any final plans of the building. The images above were in planning documents for the new development next to the station, but have not been seen elsewhere. Negotiations have been ongoing for years between Crossrail and the locals boroughs of Greenwich and Bexley, who saw previous designs as unacceptable. 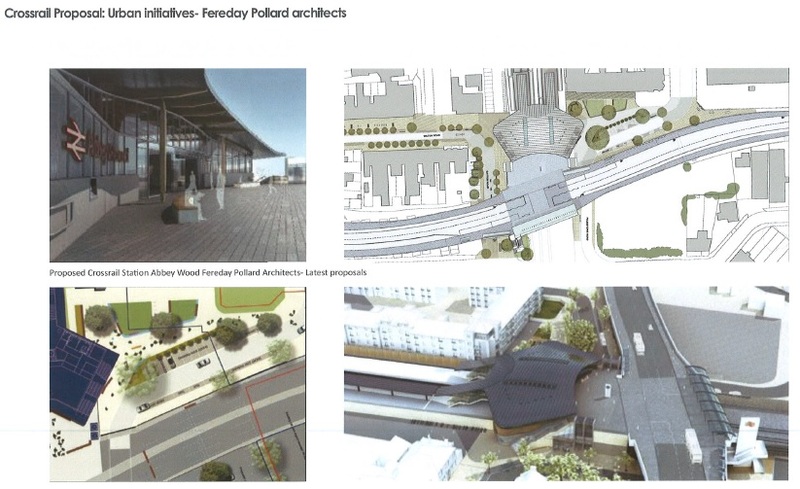 The design is crucial in improving the public realm in Abbey Wood, connecting the existing row of shops with the new Sainsbury’s being built on the other side of the line, and improving the interchange between buses and the station. The parade of shops in Abbey Wood Village has been starved of funds and neglected for years, and the existing walkways and stairs an ugly concrete blot. There is an open day about the plans on Thursday 11th July at Knee Hill community centre in Abbey Wood. The station car park is due to close imminently to become the base of the construction site. Great blog, your insight is very thought provoking and i thank you for taking time to share your thoughts especially not being familiar with the areas. Ive just had a letter from Grennwich council telling me they are going to remove me from my allotment at church manor way. ive only had it 9 months, it was overgrown and ive spent the summer clearing it. it seems i have weeds on it and im going to lose it. somehow im not suprised. That sounds out of order – I don’t recall the Crossrail plans encroaching on allotments and that has been kept quiet. Did they explicitly say it was due to the Crossrail maintenance plant?